White ceramic arabesque shaped mesh-mounted mosaic tile. In need of a simple and timeless finishing piece for your kitchen backsplash? 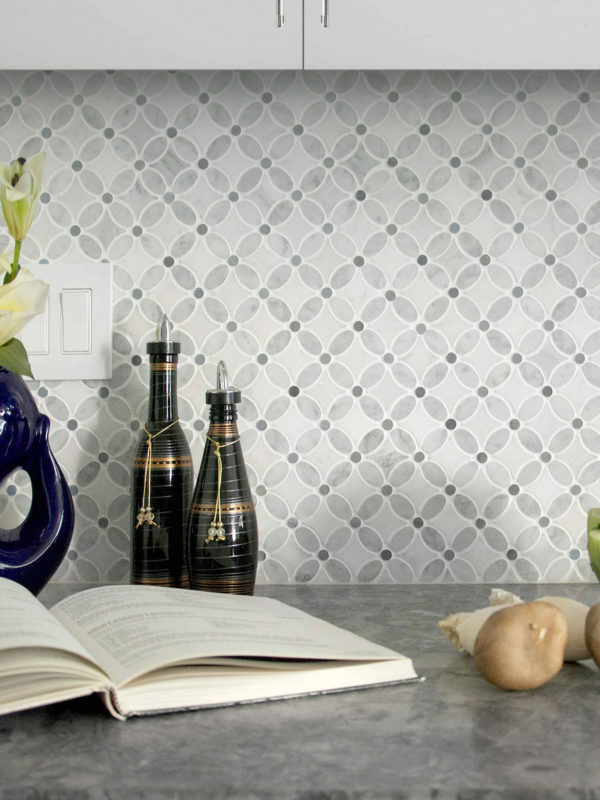 White backsplash tile offers a versatile palette around which you can build any design your heart desires. From slick modern subway tiles to white marble veining that resembles old Italy, you’ll find something to fall in love with in our vast collection of white backsplash tile. Ideal for modern spaces, white backsplash tile creates a clean and simple ambiance that is eye-catching with its unexpected simplicity. The endless combination of materials that can be transformed into a beautiful white backsplash tile is appealing for those who love the stark contrast of bright white with different textures and natural appeal. From marble to porcelain to metal, a mosaic tile that features white as the predominant coloring can be transformed into a sterile aesthetic, a retro appeal, or a vintage vibe. With its versatile visual, you’ll be guaranteed to combine it with any of your existing kitchen features, including brightly colored granite countertops or dark cabinetry. In a space that frequently feels small or cramped, a bright white backsplash tile can instantly make it feel more open and airy. As the lighting reflects off of a potentially glossy surface, you create a glittering appearance that bounces, even more, light in your dark space. The brighter it looks, the more open your kitchen will feel. A clean and modern aesthetic appears effortless with the timelessness of clean white kitchen backsplashes. Our high quality collection will impress you and add the sophistication and simplicity you’ve been striving for in your kitchen project. Freshen up your space with bright white backsplash tile and some modern flair. You won’t regret taking the leap with this classic monochromatic color scheme that creates high-end design in just minutes.